In the mood for the perfect cocktail to ring in the season 7 premiere of AMC’s The Walking Dead? Me too. Eeesssspecially after what just happened on that episode. Today’s cocktail, the ‘Double Under,’ is courtesy of HG Supply Co right here in Dallas. 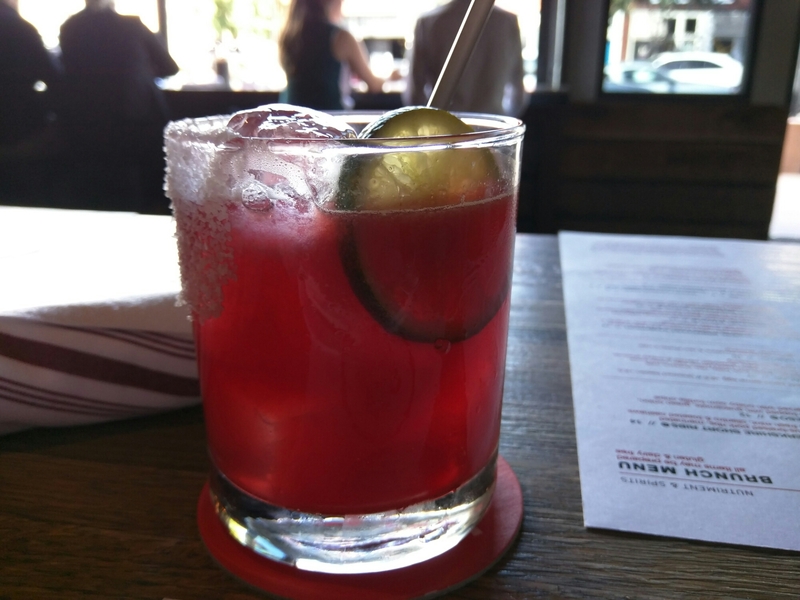 The ingredients as they appear on the menu: beet-infused pueblo viejo tequila, lime, cointreau, rosemary turbinado. Even the name is kind of apropos for the season premiere episode. You know if the phrase was ‘I doubled under in pain.’ Kind of? No? OK.
Moving on to appearance, obviously this drink is going to be blood red due to the beet infused tequila. It is garnished with a slice of lime and a half glass roll in salt; I like the slice of lime in the glass because I tend to muddle whatever is in my drink with the straw when I fidget in between rounds. I won’t pretend that the amount for salt on the side of the glass isn’t little more than for aesthetic value, but I guess if you changed your mind about wanting some salt to cut the sweet, you can lick the side of the glass. Taste wise, I could order more than one of these if I was eating something super rich. Because it has enough bright burst of flavor to balance a fatty dish, and the earthy beet flavor does indeed seep through. The lime + cointreau combo never goes wrong with tequila, making this a low-key beet margarita. The drink was a bit on the sweet side, and subtle with the rosemary. I was actually worried about the amount of rosemary sugar that would be in here; you know how some people hate cilantro because it tastes like soap? Rosemary tastes like pine cleaner to me. I like the smell of it, not the taste. As such, in my personal cooking, I tend to use whole sprigs of rosemary for that hint of woodsy, but I remove it before serving. Why is it the perfect accompaniment for the season 7 premiere in of ‘The Walking Dead?’ Other than the red? Well this Dallasite finds comfort in a good Margarita, and this was an unexpected treat. And when you just witnessed what AMC dealt us, you will need to reach for something that lets you know there is still goodness and joy in the world. And at the $10 price point, totally worth it for the uniqueness and unexpected balance.